경주시 황남동 미추왕릉 지구에 있는 삼국시대 신라 무덤인 황남대총에서 발견된 병 1점과 잔 3점의 유리제품이다. 병은 높이 25㎝, 배지름 9.5㎝이고, 잔① 높이 12.5㎝, 구연부 지름 10㎝ 잔② 높이 8㎝, 구연부 지름 10.5㎝ 잔③ 높이 10.5㎝, 구연부 지름 9.5㎝의 크기이다. 병은 연녹색을 띤 얇은 유리제품으로 타원형의 계란 모양이다. 물을 따르기 편하도록 끝을 새 주둥이 모양으로 좁게 오므렸다. 가느다란 목과 얇고 넓게 퍼진 나팔형 받침은 페르시아 계통의 용기에서 볼 수 있는 것이다. 목에는 10개의 가는 청색 줄이 있고, 구연부에는 약간 굵은 선을 돌렸으며, 손잡이에는 굵은 청색 유리를 ㄱ자로 붙였다. 손잡이에는 금실이 감겨져 있는 것으로 보아 이는 무덤에 넣기 전 이미 손상되어 수리하였던 것으로 추측된다. 잔①은 병과 같이 연녹색 유리를 사용했고, 위는 넓고 밑은 좁아진 컵 모양이다. 구연부 주위는 속이 빈 관(管)모양으로 돌리고, 그 위에 청색 유리띠를 한 줄 둘렀다. 몸체의 윗쪽에는 청색 유리로 물결무늬를 두르고, 밑쪽에는 격자무늬를 도드라지게 새겼다. 잔②는 색은 연녹색이고 구연부가 넓다. 구연부 주위는 약간 도톰하게 돌기가 있으며, 밑면의 가운데 부분이 약간 들어가 있다. 잔③ 역시 연녹색이고 구연부가 넓은 원통형이다. 구연부 주위는 관(管) 모양이고 위와 아래에는 약간 청색을 띠고 있다. 모두 파손이 심한 상태로 발굴되었으나 다행히 원형을 알아 볼 수 있게 복원되었다. 병과 잔①은 매우 가까운 거리에서 출토된 것으로 보아 세트를 이루었던 것으로 짐작된다. 유리의 질과 그릇의 형태 색깔로 미루어 서역에서 수입된 것으로 추정되어, 그 당시 서역과의 문화 교류를 알게 해 주는 자료이다. 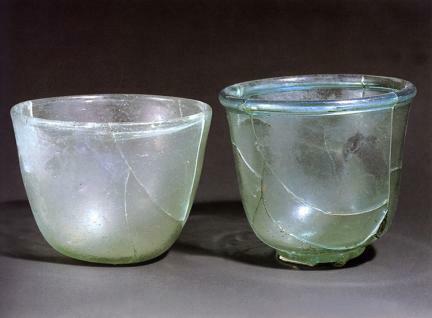 A glass bottle and three cups were unearthed from a wooden box in the South Mound of Hwangnamdaechong Tomb located in Hwangnam-dong Village in Gyeongju (the capital of Silla). 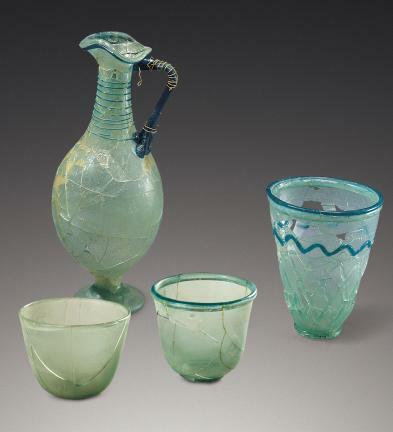 Of the various glass products found in the ancient tombs of the Silla Dynasty, this set has the most peculiar forms. The bottle is 25cm in height and 9.5cm in diameter, and each cup is of different size: Cup I is 12.5cm in height, 10cm in diameter. Cup II is 8cm in height, 10.5cm in diameter. Cup III is 10.5cm height, 9.5cm in diameter. 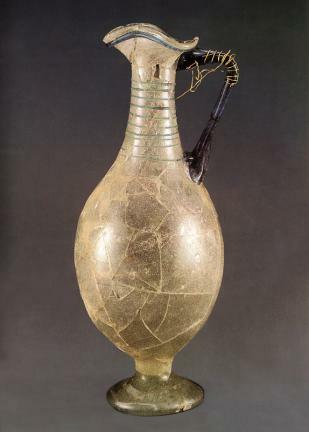 The bottle, made of thin glass, is in the shape of a long egg-like ellipse, soft green in color. Details of the bottle are as follows: 1. The top of the bottle is like a bird's muzzle for the convenience of pouring water. 2. Like Persian dishes, it has a unique curve: a delicate neck and horn-styled coaster. 3. There are 10 fine, blue lines on the neck and a little coarse string on the mouth. 4. Attached on the handle is the first letter of the Korean alphabet, ‘ㄱ’. The golden thread rolled on the grip seems to be proof of repairs due to damage before the burial. 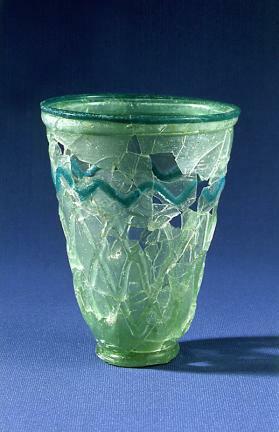 Glass cup I is light green in color and is broad on top and narrow on the bottom. Some characteristics of cup I are: 1. A decorative vacant tube-like form around the mouth and another blue, decorative line of glass just over it. 2. The engraving of blue wave patterns on the upper body and lattice below it is unique. Glass cup II is light green and has a broad mouth. Details of cup II are as follows: 1. Rather thick around the mouth and around it are small risings, 2. The appearance of a dent in the middle of the base. Glass cup III is also light green in color and the shape of mouth is broad and cubic. Features of cup III are as follows: 1. A decorative tube is around the mouth. 2. Light blue in color on the top and below. Although they were found deeply damaged at the time they were dug up, they have all, fortunately, been restored to their original form. Cup I, especially, is thought to have been imported from a Western country due to the quality of the glass, color, and shape. Therefore, this discovery is historically valuable since it serves evidence that cultural exchange and international trade with Western countries existed 1,500 years ago.